The RRN 3xx5 series (without ultrasonic bath) is the perfect solution for the high output range Each cleaning station is completely free of hoses. This not only increases pharmaceutical safety, but also simplifies maintenance and cleaning efforts. By using a servo driven internal spraying needle motion, different container sizes can be processed without changing the internal spraying needles. The external cleaning stations are mounted above the transport system and can be easily adjusted for a specific height, angle, and lateral position. 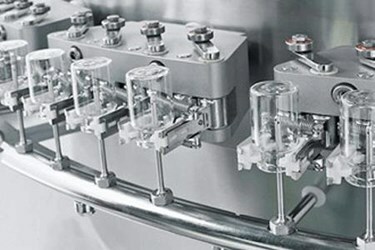 Bosch washing machines process ampoules, vials, cartridges and syringes.